I cannot stress the glee I am experiencing with all of the FAB nail design collection collaborations. The newest one that I have encountered is fashion house Prabal Gurung's collaboration with Sally Hansen. The duo are offering two Salon Effects nail wraps based off off Prabal Gurung's Spring and Summer 2012 collection. This not the first time Sally Hansen and Prabal Gurung have teamed up. Previously they have collaborated to offer a set of limited edition polishes for nail looks during Prabal Gurung's fashion shows. 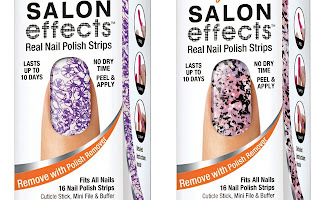 Their current Salon Effects nail wraps are in stores now.